In a previous post I reported that when I did a survey of wireless access points near where I live about 2.5 years ago, I found that 7% of wireless access points were unencrypted. Recently I needed to check what wifi signals were active in my house in order to diagnose some signal interference problems and while I was at it I decided to do a quick check to see if the wireless landscape of my neighbourhood had changed significantly in the last few years. I am not sure why people are becoming less willing to leave their wifi access point unencrypted, but from chatting to friends I think that people are not really concerned by the impact that casual users might have upon their own internet browsing. In fact they are more concerned about the fact that they could get into trouble if a passer-by used their wireless access point to engage in some illegal activity on the internet. In the previous survey, well over half of the access points had a SSID of the form eircom_XXXX which is probably a clue that they got their wireless access point from eircom and never bothered to change the default SSID. Since eircom was originally the monopoly supplier in Ireland this showed me how many people like to stick with the default choice. 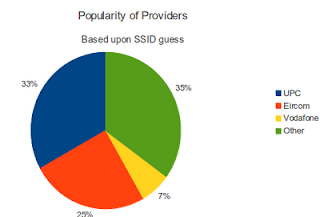 However, in the more recent survey I noticed that SSIDs of the form UPCXXXXX seemed to becoming more popular which probably indicates that many people are opting to switch to the cable modem service from UPC - although it also indicates that many still don't bother changing the default settings on their router. The following chart shows that based upon my totally unscientific survey UPC seem to have overtaken Eircom in my local market. Most of the people in the "other" category will have changed their SSID from it's default, so I can't guess what internet provider they might be using. Is the unrestricted distribution of music on the internet really a threat to the music industry? 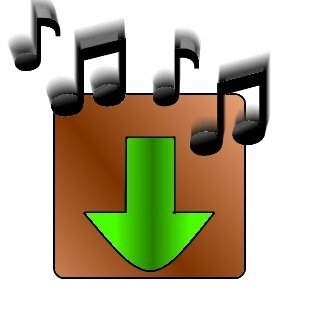 The recent controversy about the Stop Online Piracy Act (SOPA) in the United States and its close equivalent in Ireland has largely been represented in the media as a battle between the rights of music consumers (who want to be free to do anything they want to) and the music industry (who want to be able to exert as much control over online activity so that they can protect their livelihood). While there is some accuracy in this portrayal, the reality is much more subtle. The musicians who are involved in composing and/or performing music. People who are involved in facilitating the distribution of music e.g. people working for record companies or working in a music venue. I think that the later group of people might have a reason to fear that the unrestricted distribution of music might threaten their jobs, because the internet makes music distribution so easy that they are not needed as much as before. However, I don't think that the musicians have anything to fear. On the contrary, modern technology means that the current generation of youngsters find that it is easier than ever before to create music and to distribute it to music lovers all over the world. Similarly, people are listening to more music than ever on their various different devices. Hence I think that the future of the music industry is very secure. In recent years the number of professional recordings made by formal record labels has been actually increasing. The number of home made recordings is increasing at an even more dramatic rate, because the cost of the equipment required is dropping and the equipment is becoming easier for non-experts to use. Of course, the record industry is not happy with their reduced profits because they are selling fewer copies of each recording. However, there is very little sign that the music industry is in decline and consumers have no reason to fear that the range of music available will decline. Users of public transport in Dublin will have been delighted to see that Dublin bus have recently been putting display signs on some of their busier bus stops to tell potential travelers how long they will need to wait for the arrival of the next bus on each of the routes service this particular stop. These display systems are connected to GPS sensors on their buses so apparently the predictions for the bus arrival time is very accurate. Unfortunately it is not feasible to put one of these fancy displays on all bus stops. However, this does not mean that people who are not lucky enough to have a display on their local bus stop cannot benefit from the GPS data because the data behind the system is also published in the form of a feed to. There are several smartphone applications that use this data, but my favorite is Next Dublin Bus, which allows you to see the expected arrival times of the next buses on each of the routes serving your favorite stops. You don't even have to know the stop numbers when you are out and about because it uses the GPS sensor in your phone to help it draw a map of stops near to where you are at the moment. This application could be very handy if the weather turns nasty, because it will allow people go to the bus stop at the last possible moment instead of waiting for a long time in the cold and rain. We also benefited from the recent launch of the LeapCard system which allows us to pay for our journey on any of the forms of public transport in the city with a single electronic card. I know that several cities have had this for years (e.g. London's Oyster card), but is exciting for us poor Dubliners to finally have this system which was long promised. As far as I understand, the factors delaying the launch were not technical issues, but political in-fighting between the various transport providers. In any case, I am glad that it is finally operational and seems to work very smoothly. These technology updates are highly appropriate for Dublin, now that it has been officially declared European City of Science for 2012. 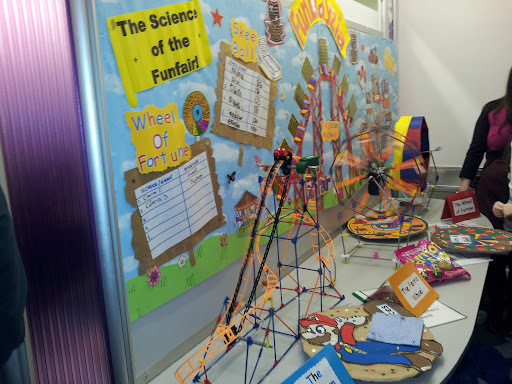 While at the BT Young Scientist and Technology Exhibition last week, I had an informal wander around the exhibition hall and this is some of the exhibits that stood out for me. I did not have time to visit all projects so it possible that I missed some wonderful projects. 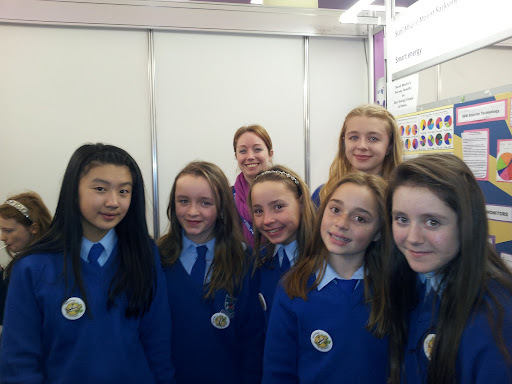 I won't cover the Primary Science fair because I reviewed it earlier. I spoke briefly with one of the students behind the overall winning project and I was very impressed with how pleasant and down to earth he was. He managed to explain a complex project in simple and easy to understand terms. He also told me about his career plans and those of his partner - I have no doubt that they will achieve all of them. 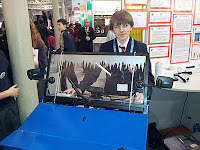 The project which impressed me most, was done by a student from Avondale Community School which was entitled "Safe driving with the ice device". This project was clearly inspired by the cold weather around the time of last years exhibition. 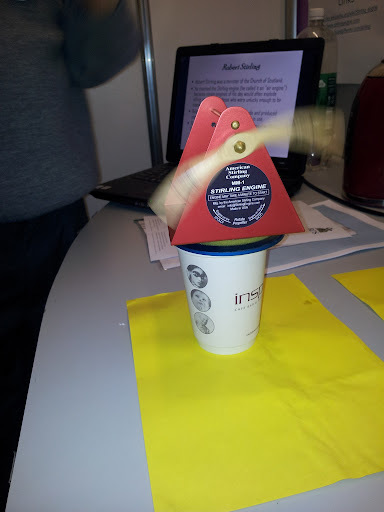 The student had developed a novel system to deal with the problem of windscreen de-icing during cold weather. The problem he spotted was the fact that water used for washing the windscreen will often be frozen and so he built a simple simple electric heater which could melt it. Then if the windscreen begins to re-freeze, the driver can simply spray some hot water onto the windscreen which will unfreeze it as well as washing it. He even took into account the fact that often the water in the pipes leading to the window washer and/or the nozzles can be blocked with frozen water and so he added a compressed air system to assist with unblocking it. I think this is an idea with a lot of potential and the student involved was very eloquent and well able to explain the merits of his system. 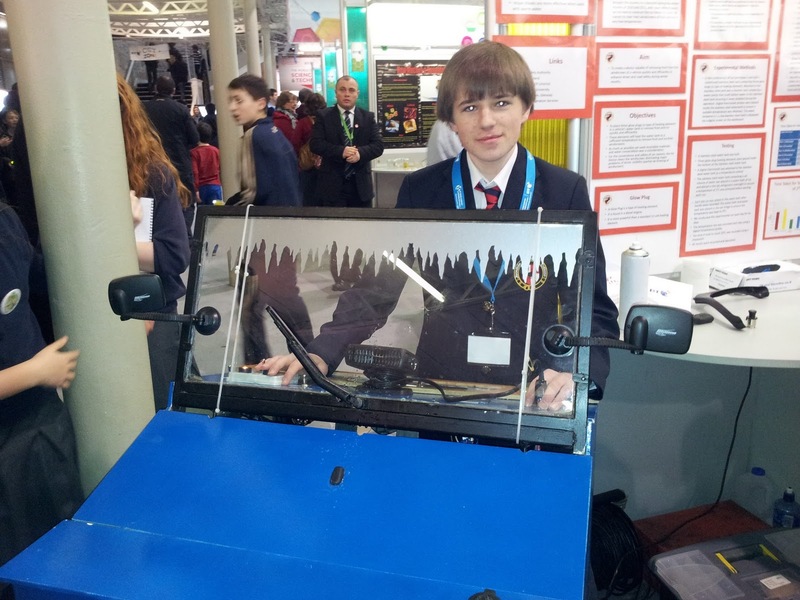 Here he is pictured with his model car demonstrating the system. Two young second year students from Desmond College in Limerick won the overall group runner-up prize for their project "InVigil8 -A Personal Portable Security System" which combined 8 different devices to help with personal protection. I don't want to seem dismissive of their achievements, but I was surprised to see that in most cases they had not actually developed any of the devices from scratch, but had instead adapted an existing device/alarm to a new usage pattern. However, what really did impress me (and presumably the judges) was the confident way that they could demonstrate their project. I think that these young students have a bright future in business even if they decide not to pursue a scientific career. Another project which was inspired by last years unusually cold weather was "Smart Pipe – An Automated Water Circulation Anti-Freezing System". This project implemented a system to stop pipes bursting during periods of freezing weather. The system they built had a motor to circulate the water within the houses plumbing system, this motor was automatically turned on when the temperature dropped below freezing point and this was effectively a less wasteful version of the old trick of leaving a tap running when freezing weather is expected. This trick is only effective when the water is slightly below its freezing point and so when the temperature dropped further the system automatically diverted water from the hot water tank into the cold water system. Since the cold water was already circulating the small amount of hot water added was dispersed and brought the overall temperature of the water only slightly above freezing. 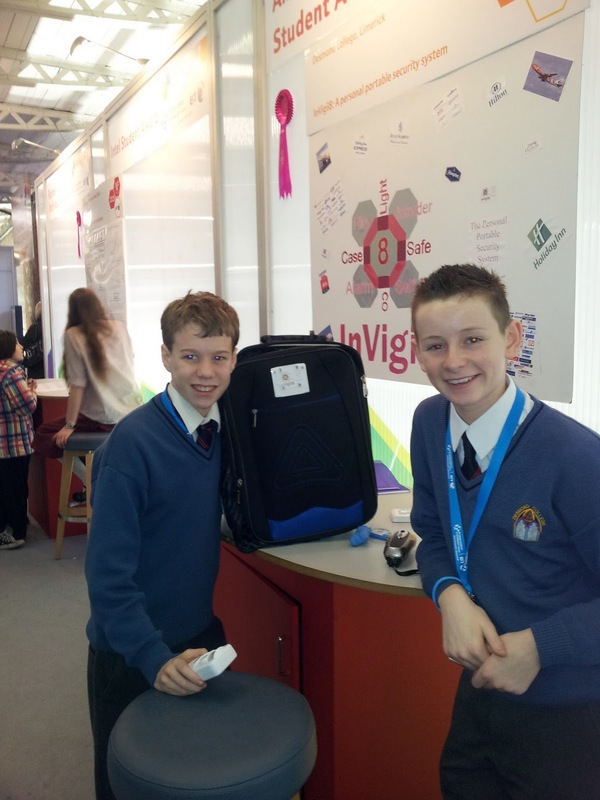 The winners of the IBM award were two students from Tipperary who had developed a database of recordings of health and diseased horse hearts. They combined their database with an existing pattern recognition system so that vets can now submit a sample heartbeat recording from one of the horses under care and the application will tell them what heart disease (if any) the horse is suffering from. Read more about their project here. The project "iCollapse:A mobile phone application for assisting those who are liable to collapse" should have won the prize for the most catchy project name is one was being given out. It also had a very clever and useful application - it uses the accelerometer and sensors in someone's iPhone to detect when the person had collapsed and then it will automatically contact a carer to come check on them. This is clearly an idea with great potential and I hope the student involves goes on to make it generally available. Another ambitious technology project was the student who developed the FreeFlowApp web site combining formal traffic reports with people tweeting about traffic issues on the twitter platform. I know from experience that this is a simple concept, but very difficult to implement in practice. At the exhibition the student had a working version of the web site - not only could I see him demonstrate it himself, but I was also able to access it myself on my phone. Unfortunately the site does not seem to be active anymore. As well as the student exhibitors, there were also a number of exhibits run by professional science and technology organizations. 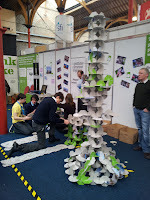 Naturally I thought that the IBM stand was the best, but I was also particularly impressed by the stand run by Institute of Structural engineers. 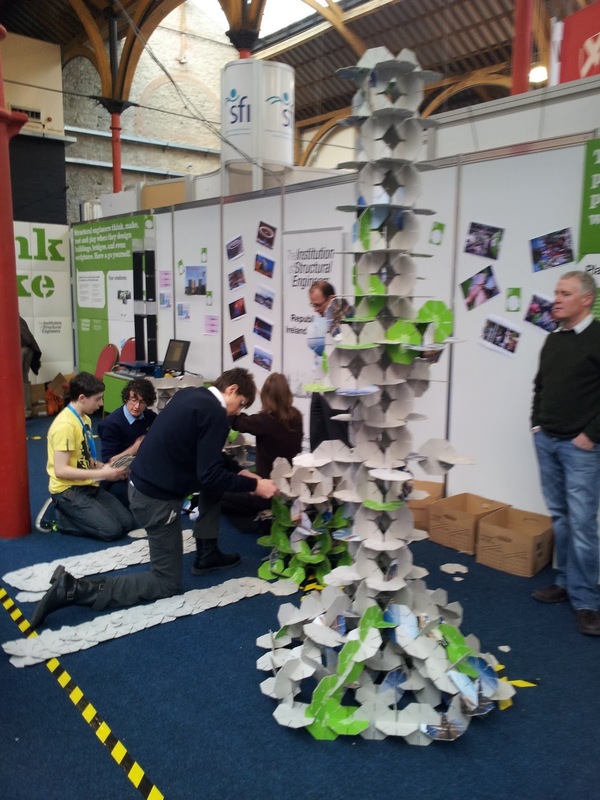 Their stand was not very complex, but they managed to get visitors actively involved in the real issues dealt with by structural engineers by getting them to build complex structures out of paper discs. As you can see from the picture some of the resulting structures were very complex and I think people seemed to be spending hours at their stand. As I reported before, the download speed of the connection between my house and the ISP is typically not the factor that the determines the overall responsiveness on most web sites. However, I recently decided to sign up with one of the broadband/TV/phone packages with UPC and I was tempted to upgrade my internet connection speed from 25Mbs to 50Mbs at the same time because the cost difference was minimal (€5 per month). I must compliment the UPC staff for how helpful they were in making the upgrade process as simple as possible. Next I tried running the test from a laptop which was connected by wifi link with a nominal speed of 56 Mbs (I was sitting right beside the router so the signal would have been very strong). Unfortunately, I could only achieve ~20 Mbs download speed. Since I was using the same test service and the same ISP link, it is clear that it was the link bertween the laptop and the WiFi router that was causing the bottlekneck. I tried connecting via Android phone I could only achieve a download speed of about 10Mbs, but when I disabled encryption on my WiFi router the speed of the connection from my phone increased to 20 Mbs (the same as the laptop connection). Clearly the CPU load on my phone to encrypt the packets was limiting the transfer speed. As a result I decided to disable encryption on my router in common with my policy of allowing casual sharing of my network link with anyone nearby. I was quite pleased to see that the upload speed had increased from the 1 Mbs I was getting with the 25Mbs package to 4.6-4.7 Mbs with the 50 Mbs. The upload speed did not seem to vary much from measurement to measurement which incicates that the connection between my house and the ISP was indeed the limiting factor in the overall performance. I think that this increase in upload speed alone will justify the extra €5 per month that they charge for the faster service. 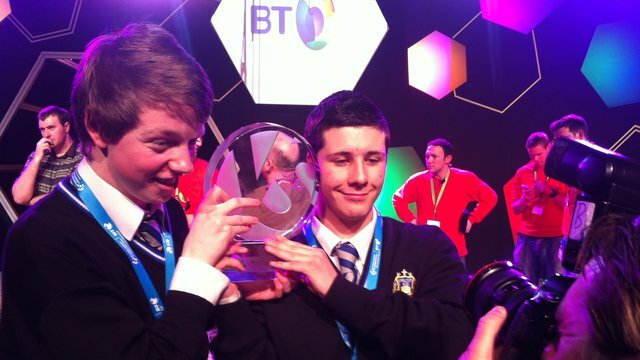 I just heard the news that two 17 year old mathematicians Eric Doyle and Mark Kelly from Synge Street, CBS won the overall best project award at the annual Young Scientists competition. I didn't yet get a chance to view their project entitled "Simulation Accuracy in the Gravitational Many-Body Problem", but this brief description makes it clear that it was a very complex project and I am sure they were very worthy winners. However, what is really impresses me is that this is the third time in recent years that the overall prize has been won by a maths related project from this same school. I don't want to take away from the great work done by the students, but I think that the person who deserves most praise is their teacher Jim Cook who is apparently great at encouraging his pupils to take an active interest in Maths and Science. In recent times, many commentators have been moaning about the declining interest in maths and physics among the current generation of teenagers who see as being "too hard". Clearly what this country needs is more teachers like this who can help their pupils to learn to love these very rewarding subjects. I started blogging at the end of 2008, so 2011 was my third full year of blogging. So I thought it might be a good time to review briefly my blog activity and life in general. The number of blog posts I wrote in 2011 was 84, which is slightly down on the 113 posts I wrote in 2010. However, most of the drop is accounted for by the elimination of the weekly reviews, which I started at the start of 2010 and then abandoned. I have settled into a steady rhythm of roughly 2 posts a week and a reasonably stable set of topics involving mainly technology and gadgets. I am happy with the tone of the blog and the level of interest it generates. The one thing that surprises me is how little I blog about IBM or the products that I work on. I think that the reason for this is not that I don't have anything to say about IBM products, but it is because I need to think more carefully before expressing an opinion about IBM products. For example, I spent almost 3 months working on a recent article for Developerworks while a typical blog post is written is less than a half an hour. I may increase the work related content on my blog, but it will probably involve mainly short posts pointing at more substantial articles that already exist elsewhere on the web. In terms of life changes, the biggest change in 2011 was my decision to move from a people management role to an individual contributor role. As I blogged recently, I am still struggling to settle in to the changed role, but I am still happy that I took this brave decision. I think that it will the end of 2012 before I will be totally clear on how I feel about the change. Getting Things Done (GTD) was one of the main topics in my blog for 2010, but it is not mentioned at all in 2011. This is mainly because I have stopped implementing the GTD methodology. My decision to abandon GTD is because my work now involves a smaller set of substantial tasks to complete as compared to my former role as a manager which involved tracking many different tasks each of which involved less work from me directly.